From 1922 to 1957 FC Barcelona were playing at a sports stadium called Les Corts. By the late 1940s it was clear that its 60,000 capacity wasn’t sufficient to satisfy the demand for football in the Catalan capital. With no way of expanding this ground the club president, Joan Gamper, began preparing plans for a move away from Les Corts to a new stadium for the club. His vision became a reality in 1957 when Barcelona played their first match at the Camp Nou – in English we call it the Nou Camp – where the initial capacity was over 106,000. Major redevelopment took place in preparation for the 1982 World Cup where almost 122,000 fans watched watched Belgium beat the holders Argentina in the opening game. This enormous capacity was significantly reduced in the late 1990s to around 98,000 as UEFA banned standing areas at football arenas. 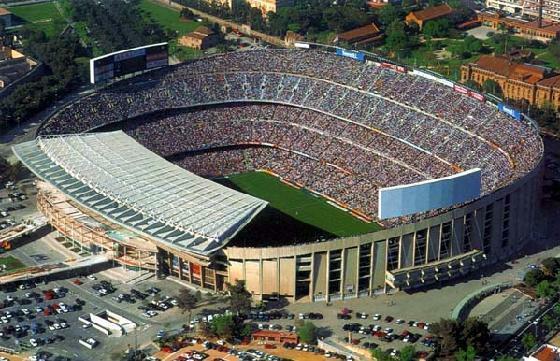 Today Barcelona’s Nou Camp stadium is the largest in Europe with an official capacity of 99,354. 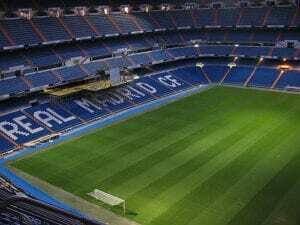 This is reduced to 96,336 for football matches organised by UEFA. Major events hosted there have included the 1992 Olympic Games football finals and the unforgettable 1999 Champions League Final when Manchester United somehow beat Bayern Munich with two injury time goals. Another major development which has enjoyed enormous success is the FC Barcelona Museum and Nou Camp Stadium Tour. The museum was opened in 1994 thanks to the foresight of ex-President Josep Lluis Nuñez who was in charge of the club when they won their first European Cup in 1992. Today it is the region’s most popular tourist attraction with over 1.5 million annual visitors (even Picasso and Dalí can’t beat those numbers!). It is widely considered to be one of the best football museums in the world. The financial crisis in Spain has severely delayed plans to remodel the Nou Camp based on a Gaudi theme with a proposed capacity of 105,000. Current estimates suggest that the 5 year project is unlikely to begin before 2017. In spite of this enormous capacity FC Barcelona has approximately 103,000 ‘socios’ (season ticket holders) which means that the ground cannot accommodate all its members. Even though you might see empty seats on Sky TV when watching a match at the Nou Camp this doesn’t mean that tickets were available. It simply means that members did not attend. There is a process whereby members can sell their season ticket to the club on a match to match basis and on these occasions a few seats do become available. To avoid disappointment it’s a better idea to pre-book tickets through our ticketing service and collect them on arrival in the city or have your them delivered to your hotel. These tickets are supplied by a Barcelona based travel agency and are fully guaranteed. Nou Camp by Metro – If you’re staying near the Ramblas you can get on the green Metro line 3 at Plaça de Catalunya or at Liceu (right outside the Opera House and on the same side of the Ramblas) heading in the direction of Zona Universitaria. Get off at Maria Cristina Leaving the underground by the exit marked “Sortida: Av. Diagonal”. As you come out of this exit you will see two huge black towers owned by La Caixa on the other side of the road. Keep them to your left and walk about 200m along Avinguda Diagonal where you’ll see a road sign for FC Barcelona and Joan XXIII.On the other side of the road you’ll see the Hotel Princesa Sofia. Cross the main road (the Avinguda Diagonal) here and take a left after the hotel heading down Joan XIII. You will see the stadium about 200m ahead of you. Some fans prefer to get off at Les Corts which is slightly closer, just follow the crowd. An alternative route by Metro is to take the blue line 5 heading for Cornella Centre then get off at Collblanc and follow signs for the stadium. After the match with thousands of people looking for transport the metro is by far the best way to get back to the Ramblas area if that’s where you’re staying. You can get a beer at a bar on the way to the station to let the crowds die down a little as the Metro operates until 2am. Nou Camp by Bus – The following bus lines serve the Nou Camp Stadium: 7, 15, 43, 67, 68, 74, 75, L12, L50, L60 and L62, however, with all the traffic on match days it’s a much better idea to use the very fast and efficient Metro system. Nou Camp by Taxi – A taxi to the stadium from around the Ramblas area shouldn’t cost more than €12, however, the traffic can be so bad that the meter creeps up even further. After the game there are no taxis available for a long time after the final whistle and all the streets near the Nou Camp are packed with traffic making the Metro the best public transport option. Free Coach Transfers on Matchday – If you book your match tickets with Spanish Fiestas return transport is provided to the match from the bottom of the Ramblas. Outside the Nou Camp on matchday you’ll find ticket touts hanging around the ticket windows. One of their favourite tricks is to show you a postcard of the stadium and point out where the seats are located that they’re trying to sell to you. It goes without saying that their information is not to be trusted. 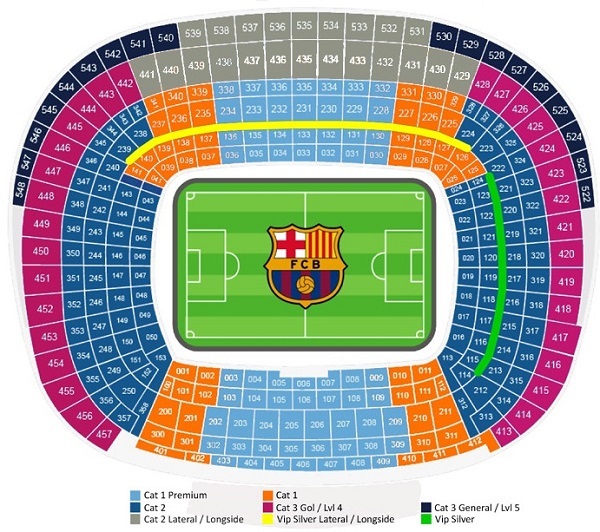 For peace of mind you’re far better off pre-ordering your Bacelona tickets https://www.spanish-fiestas.com/football/fc-barcelona-tickets/ from a reputable ticket broker. The following stadium plan shows you the stadium’s seating plan. The ‘Camp Nou Experience’ is more than just a museum! Whilst visitors can browse vast amounts of memorabilia and enjoy multimedia presentations about the club’s illustrious history, you can also take a self-guided tour of many of the Nou Camp’s facilities including the changing rooms, take a walk down the tunnel and stand at pitch level. You also have access to the substitute’s bench, the altar, TV studio, press rooms, directors area and get a panoramic view of the stadium. Getting There – Many visitors to Barcelona buy a day ticket for the northern route of the hop-on, hop-off bus service then get off at the Nou Camp Stadium bus stop which is just 200m from the club’s museum. Otherwise refer to the information listed above which provides the numerous options for getting to the stadium. There is limited access on matchdays. See Camp Nou Experience for current prices and to confirm opening times. Order Nou Camp Tour Tickets – Tickets for the “Nou Camp Experience” include entrance to the museum, a tour of the Nou Camp, access to the multimedia area and an audioguide which is available in various languages. You can pre-book your Nou Camp Stadium Tour and print out your tickets online. If you’re visiting Barcelona as part of a general city break then there’s no point booking a hotel near the Nou Camp, you’d be far better off staying somewhere nearer to the Ramblas and the tourist centre. However, if you’re only in town for a match then there are a few very nice hotels near the stadium. The 5-star Princesa Sofia Gran Hotel (Plaza Pio XII) is the stand out property lying less than a ten minute walk from the ground. A number of more economical options are also in the vicinity. take a look at Booking.com’s Nou Camp Hotels for more information.